I bought a papaya a few days age and still stored in the refrigerator. Last night, a friend stay my house, therefore, this morning , I cook Papaya Milk as breakfast for her. First of all, Boiled a pot of water, put the longan and jujube. And then, papaya,peeled and cut into small pieces ,put them into pot. 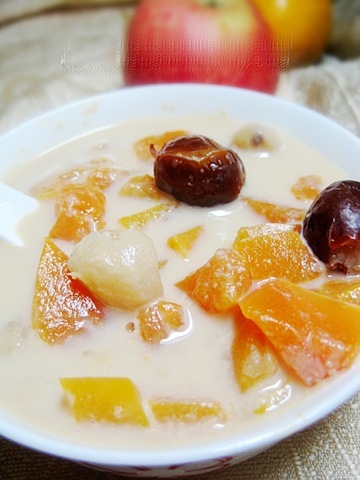 At lastly, when the water is boiling,add two spoonfuls of brown sugar and milk, when them boiling again, the papaya milk is finished. It is well-known that the papaya can enhance breast , So, women can eat more.